Hi guys! Today I thought I would do a little life hack post for you as we all benefit from them, don’t we? I recently started using this little trick that uses sellotape to keep your eyeshadow line clean, makes your eyeliner easier to do and look more precise. I used to never wear winged liner and this trick really built up my confidence to wear it, I now wear it every day and apply it freehand. If I can do winged liner, anybody can! Step 1) Cut two small bits of sellotape and apply them from your lower lash line up to the end of your eyebrow. This is the perfect angle for the eyeliner to be to look professional and on point. Step 2) Once you’ve applied your eyeshadow if you’re wearing any, draw a line parallel to the sellotape from your upper lash line corner however far you want up to the brow. Step 3) Draw the line from your inner corner out to the wing connecting the wing to the line smoothly. 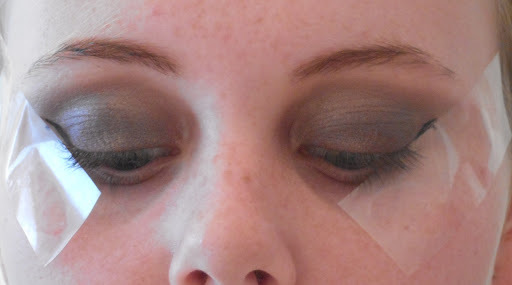 Step 4) Peel away the sellotape and you’re left with a clean line of eyeshadow with your eyeliner matching up perfectly. If you were wondering I’m using the L’Oreal so couture liner which I think is so good and super affordable. I find it works really well as it’s a felt tip style so is easy to hold and apply. Hope you enjoyed today’s post! Let me know if you’d like some more makeup hack blogposts in the future as I really enjoyed writing this. Leave me a comment if you have any little makeup tricks or hacks because I would love to know and I’m sure everybody else would too!